One bumper plate of specified weight. Almost all bumper plates on the market are made with rubber. These are a big step up. The problem with rubber is it degrades. Urethane is heat resistant, sunlight resistant, odor free, and lasts a lifetime. Intek found these to hold up incredibly well to drop tests. The matte color also keeps them looking new for longer (no abrasion marks that stand out). 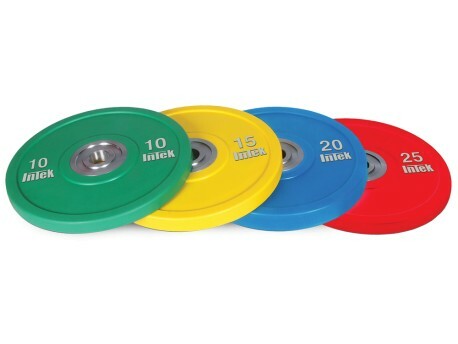 These have the same dead-blow low bounce of most bumper plates. Basically, with urethane there's no downside other than the extra investment. The wide chromed steel hub extends an extra 1.75" out from the hole, ensuring they will not pop out, making them closer in quality to competition bumpers. The raised weight lettiering isn't painted. The material on those is made of grey urethane all the way through the thickness of the lettering, so the grey color will not wear off. The precision-bored hole is just 1mm larger than the typical 50mm bar sleeve, for a snug fit. The regulation spec for all bumper plates. Get them made with your gym's or school's logo! See here for details. Unlike other manufacturers, Intek does not maintain a deep stock of products in a large warehouse. They rely on only stocking enough products to fill existing orders. Their products are worth the wait, we promise!